I love my job, as I was once again blessed with a revelation of our Lord and Saviour Jesus Christ. During my reflection time (while watching some deep Adam Sandler movies to switch off my mind), The Lord said to me: “Grace acts, The Law reacts.” You see, the girl in the case above, who ‘cheated’ on her guy, is not an evil person anymore than she was an insecure one. We can label her as evil if she was truly acting out of her own drives to cheat on her boyfriend but what we saw was that she was merely reacting to the thought that her boyfriend was cheating on her. This is how The Law operates; it REACTS. It blesses us if we are good but it curses us if we do wrong. The Law is not our friend because it doesn’t act on its own accord; the law is programmed to react to the product of our works. However, God acts through His Grace; His loving-kindness. GOD ACTS AND HE DOESN’T REACT. He is good, He is all loving, and He is forever blessing us NOT because of what we did or because of who we are. He loves us because of Who He Is. And praise His name forever because Jesus Christ is Love. And this love is unlike the love of the guy who was hurt in the relationship above who said that he STILL loves his girlfriend. No, because of The Lord, He will never say: “I still love you”. God loves us so much that even while we were still sinners, Jesus Christ already died for us on the cross (Romans 5:8). This is one sacrifice for all sins FOREVER. The only things from earth that will exist in the eternal heavens are the nail prints on Jesus’ hands and feet (and the spear wound). This is Jesus’ way of saying: I LOVE YOU FOREVER. And unlike any puppy love couple, when the Creator of the universe says: “I love you”, it is never in a cheap way; it is eternal. It is a shadow of the love that drove Abraham to offer his beloved son to God, and yes, it is the shadow of the very same love that drove king David to his knees and worship The Lord. 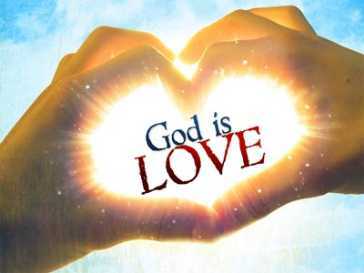 God loves you because of Who He is and He will forever love you because of Who He is. This He does out of the fullness of His eternal loving Being and never as a reaction from our sinful, empty and bankrupt lives. This is the grace of God. Glory to the name of Jesus Christ, forever.